The animals are getting hungry on this safari adventure 5 reel online slot game. Travel through the Serengeti on your armoured jeep and match up an inquisitive range of animals including elephants, banana-eating monkeys, and ostriches to restore the safety of the great planes to earn yourself some free spin bonuses and luxurious cash rewards. NextGen Gaming was established in 1999, just in time to take part in the birth of the online casino industry. Since then NextGen has established itself as a reputable online casino software developer, providing profitable, entertaining and stunningly attractive casino games. Always one to stay one step ahead of the game, NextGen also provide a free-play social network over Facebook. This award-winning play-for-fun Facebook slot site demonstrates this developer’s dedication to adaptability and commitment to provide the best service for its players. Have you ever wanted to go on a Safari trip in the heart of Africa? Well now you can go on this amazing adventure from the luxury of your own home with Super Safari online slot game. Just like a real safari, this 5 reel, 25 payline slot game comes with an abundance of wild and exotic animals for you to find. Whether you want to look for the big game or the small game, Super Safari is happy to accommodate. There are 7 line options to choose from, 1, 3, 5, 10, 15, 20 and 25 and 9 staking options from 1p coins to £2 coins. So why not hop into the zebra printed jeep and go on a brilliant adventure! The whole point of a Safari ride is to find as many animals as you can, and decorating your reels are elephants, rhinos, giraffes, crocodiles, zebras, ostriches, hyenas, monkeys and meerkat symbols. 3 meerkat symbols will multiply your stake by 5x, and 5 will win you 100x your stake! 5 monkeys or hyenas will reward you with 150x times your bet, 5 zebras or ostriches will give you 200x times your bet. 5 giraffes or crocodiles will award you with 500x, 5 rhinos will reward you with 2, 000x your bet, and 5 elephants will give you an impressive 5, 000x times your stake! This safari is not just an experience you also get some impressive multipliers! The Lion is the King of the Animal Kingdom, and will be the Wild symbol in this online slot game. He will appear on the 2nd 3rd and 4th reels, substituting for all symbols except the Scatter Jeep, Hippo symbols and Binoculars which are the bonus symbols. 3 Lions will also trigger the Jungle Respins, with the Lions becoming Expanding Wilds. The Jeep is the Scatter symbol and will double your winnings when you find 2 symbols, 5x for 3, and 15 x for 4 and 250 x for 5! 3 Hippo Scatters will trigger a second Scatter bonus where you get to pick a hippo and reveal one of three prizes: 150x your bet, pick again or win all. The Jeep Scatter will also trigger the Off Road Safari feature which gives you 10 Free Spins in which all prizes are doubled with the possibility of Super Spins after in which all prizes are multiplied by 5! To get the Super Spins you will need to collect Binocular symbols during the Free Spins feature. 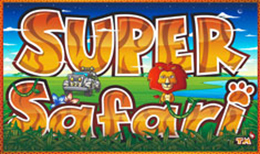 Super Safari is packed full of adventure, wild animals, bonus features, multipliers and a good betting range that everyone will enjoy this online slot game.